Thanks for posting these Jacques. Several of the details of a real Orion are missing or incorrect. For example: the brackets that are holding the folded SAW's in place, prior to deployment, are not present in this digital model. Also: the thickness of the SAW panels is uniform, whereas on an actual Orion the innermost SAW panels are over twice as thick as the outermost SAW panels. The Earth-orbit Orion is missing the white coating on the backside of the SAW's. Uncoated black backside of SAW's is applicable to BEO Orions only. The CM portion is missing a host of details on the docking system, CMA and backshell. Orion is NASA’s next spacecraft to send humans into space. It is designed to send astronauts farther into space than ever before, beyond the Moon to asteroids and even Mars. ESA has designed and is overseeing the development of Orion’s service module, the part of the spacecraft that supplies air, electricity and propulsion. Much like a train engine pulls passenger carriages and supplies power, the European Service Module will take the Orion capsule to its destination and back. The Orion spacecraft is built by NASA with ESA providing the service module. The arrangement stems from the international partnership for the International Space Station. NASA’s decision to cooperate with ESA on a critical element for the mission is a strong sign of trust and confidence in ESA’s capabilities. 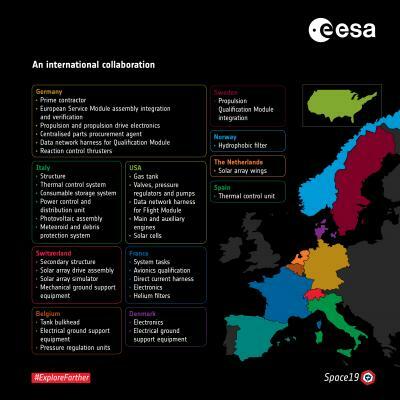 More than 20 companies around Europe are now building the European Service Module as NASA works on Orion and the Space Launch System. From the budget presentation today: Planning to reuse parts of Orion, including the pressure vessel by EM-4. 1) That's quite a long time from the first SLS launch, which is quite a long time from now. 2) Wonder how much that's planned to save. According to Zapata (PDF), Orion is expect to cost $980M per capsule if produced at the rate of one per year. I would be surprised if reuse saved anything at all at a flight rate of one per year. Question about yesterday’s Bridenstine’s testimony. Is the « surge » mentioned by him to get two SLS a year also applicable to Orion or not? Are these additional SLS for Orion launch? NASA got to figure out first what kind of BEO service module is needed for the Orion and who is going build them. See above. The European service module is built by ESA with a CMA by Lockheed. SpaceX likely to win NASA’s crew competition by months, for billions less.